Yes! I want to achieve trading excellence with The Way To Trade. Since you are ordering today, I would like to give you the opportunity to upgrade to the Bronze, Silver, or Gold Trading Packages to include John Piper's The Technical Trader Hotsheet at a specially discounted price. The Technical Trader Hotsheet gives you staggering inside information and predictions for the expected direction of several of the world's most heavily traded markets. This gives you an edge that other traders just do not have. These are not just the predictions of an expert analyst, they are the predictions of a vastly successful and profitable trader with 16 years of real world, heat-of-the-action, seat-of-the-pants market experience. If you want to be successful in anything, you must seek out those who are already successful in your chosen field. 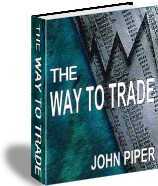 I know of no technical analyst operating today whose skills and objectivity equal that of John Piper. The Technical Trader Hotsheet must rate among the best I have read. - CH, Fund Manager, Surrey. The accuracy of The Technical Trader Hotsheet is truly astonishing. It has made me thousands of dollars and could be worth thousands of dollars every month to you. Click here for a recent sample of The Technical Trader Hotsheet in Acrobat PDF format. This will give you a flavor for the layout and quality of the Hotsheet. Upgrade to the Bronze Trading Package now and you will receive everything in the top box PLUS 3 months subscription to The Technical Trader Hotsheet, published twice monthly. The normal price for 3 months subscription alone is $125, but if you order as part of the Bronze Trading Package you receive a full $100 discount and it's yours for only an additional $25. Upgrade to the Silver Trading Package now and you will receive everything in the top box PLUS 6 months subscription to The Technical Trader Hotsheet, published twice monthly. The normal price for 6 months subscription alone is $225, but if you order as part of the Silver Trading Package you receive a huge $136 discount and it's yours for only an additional $89.00. Upgrade to the Gold Trading Package now and you will receive everything in the top box PLUS 12 months subscription to The Technical Trader Hotsheet, published twice monthly. The normal price for 12 months subscription alone is $375, but if you order as part of the Gold Trading Package you receive a massive $216 discount and it's yours for only an additional $159.00.